Nicole Donovan and Fiontar Mac Tire, competing at the Caledon Equestrian Park. Orillia Secondary School student Nicole Donovan will be the first junior to ride a stallion at the Royal Agricultural Winter Fair in its 95-year history. 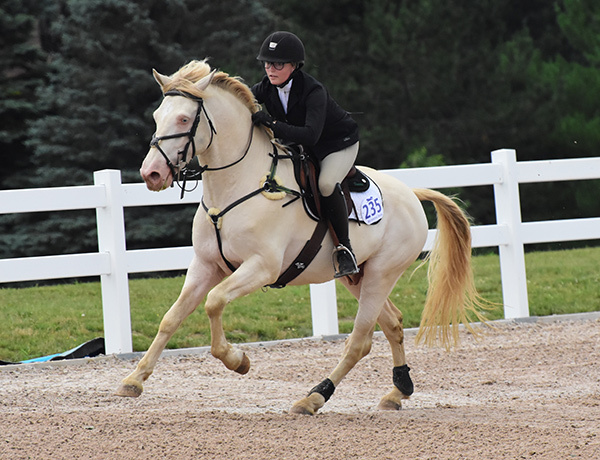 On November 4th and 5th, she will be showing Janet Rowe’s six-year-old Connemara pony stallion Fiontar Mac Tire in the Pony Jumper Division in Toronto. Rowe owns Muskoka Lakes Connemaras in Bracebridge, Ontario. In 2017, Equestrian Canada changed the rules, to allow junior riders aged 15 to 18 years old as of January 1st, to compete on stallions in the jumper classes. Previously, only adults have been allowed to ride them. After the announcement of the rule change, Rowe posted on Facebook saying she was looking for a junior rider to show the pony stallion in the jumper division. “It was hard for pony breeders to promote their stallions because, until now, there were limited opportunities for adults to ride them,” Rowe explained. “You have to build their resume and put them in the public eye to generate interest in breeding to your pony. Showing successfully in competition is important.” There was an overwhelming response to the post but something made Rowe feel 16-year-old Donovan was the rider she was looking for. The Royal Horse Show is undisputedly the de facto Canadian Championships for equestrian English style riding in hunters and jumpers. The fair is celebrating its 95th year and runs from November 3rd to the 12th at Exhibition place in Toronto. The Royal began in 1922 and it is the world’s largest combined indoor agricultural and equestrian event.